I’m constantly asked if Facebook is a social media platform that businesses should still be marketing on. For now, the answer is yes (for the most part). While organic reach hardly exists for businesses, the use of their robust ads platform still makes Facebook Ads a powerful tool for any businesses marketing arsenal. 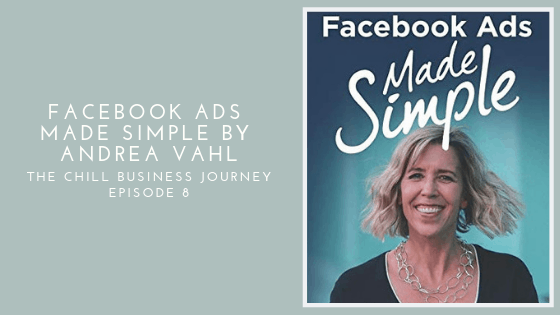 In this episode of The Chill Business Journey, I talk about the parts of the latest book by one of my favorite Facebook maestros, Andrea Vahl. Her new book is Facebook Ads Made Simple, and she has really made the Facebook Ad creation process so easy to understand, that anyone really can start launching their own ads. And once you build up your knowledge and skill set to start doing more advanced ads (which Andrea covers in the book and makes them really easy to understand), then you can really start to see some traction with your Facebook Ads. One of the key components to running ads on this platform is knowing who your target market it. This will help you choose the targeting details in the ad creation process. In the recording, I recommend taking some time to listen to another episode we released earlier this year on Creating Client Personas. There is a worksheet that accompanies that episode to help you work through that process. On the show notes for the Client Persona recording, there is also a document you can download to help you use the Facebook Audience Insights tool in the Ads Manager. So head on over to that page to get all those goodies. If you are thinking of moving your Facebook Page and Ads Account over to Business Manager, Andrea does a good job of walking you through the process. However, my friend Liz, who owns EliRose Social Media, wrote a really great article called Moving your Facebook Page & Ads Account to Business Manager. As promised, I wanted to share the resources link that Andrea created for the book: https://www.andreavahl.com/book-resources. This will be a good resource to check out while going through the book. Another item I mention in the recording is Andrea’s Facebook Advertising Secrets online course. For full disclosure, this is an affiliate link. The course is only open a couple of times per year, so be sure to get on the waitlist if it is not open when you go to the website.